Spanning from California's Highway 1 to cliff-hugging drives along the Tasmanian coast, sometimes the journey really is the destination. Book a flight and a nice rental car and go on one of these drives. This part of north-western Galicia is one of Spain's lesser known areas. It's often referred to as 'Green Spain' because of its lush vegetation and has a beautiful coastline to tour by car. If you love craggy headlands like those in Scotland, traditional fishing villages, shellfish with strange tongue-twisting names, and cider varieties that'll put hair on your chest, this is a fantastic drive. The best section is between Viveiro and Ribadeo. The nearest airport is Lavacolla airport in Santiago de la Compostela from where you'll drive up to Viveiro in your rental car. More information about Galicia at turgalicia.es. The Hana Highway is a winding road passing through lush rainforest, linking the east and west parts of Maui, Hawaii. The highway is only 60 miles long, but will still take 3 to 4 hours to drive, as you'll make plenty of stops to take in the natural wonders of Hawaii, U.S.A. There are waterfalls and many beaches to take a break at if you have the time. Getting to Hawaii means taking a flight to Honolulu airport and then a quick jump to the island of Maui. Another area of Hawaii to explore would the island of Kauai, well-known for it's outdoor pursuits and surfing. More information about vacations in Hawaii from gohawaii.com. Starting out in Melbourne, the Great Ocean Road should be on your list for things to do while visiting Australia. The road runs from Torquay to Apollos Bay as it travels alone the coastline. Every bend and turn in the road leads to a spectacular view. It rolls through 250 km (about 154 miles) of twists and turns of touring roads. It shows the beauty of the Australian southern coast. On the opposite side of the coast is the Otway Ranges with its lush green fields. Along the Great Ocean Road, you will come upon one of the most famous landmarks in Australia at Port Campbell. 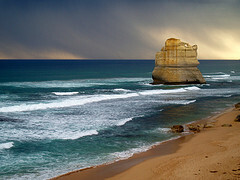 The landmark is known as the Twelve Apostles, great stone pillars that rise over the waves. As you travel west you will see the forest of the rugged Otway Ranges and the whole Great Otway National Park, the scenery is breathtaking. Make sure to see the rock formations of the Thunder Cave, Blowhole, and the Rock Arch. Ireland's northern-most county, the almost and island peninsula of Inishowen pokes out into the Atlantic Ocean between two sea lochs. 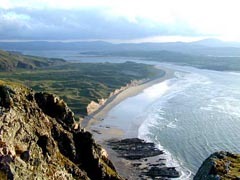 From here, you will experience fantastic views over the sea to Scotland from the Malin Head. There are also sandy beaches, Irish castles, medieval churches, and peace and quiet. Crowds are sparse, even in the peak season. For this coastal drive, take the coast road just north of Derry and head towards the Inishowen Peninsula. If you want to visit, fly into Donegal or Belfast International (Norther Ireland) and pick up a rental car there. If neither of those are economical, try flying into Dublin and go from there. On that route, you're guaranteed to find a number of other ancient and picturesque sites on your way up north. More information about visiting Ireland can be found at the comprehensive discoverireland.com site. Officially known as California State Route1, it's also known as the Pacific Coast Highway, this legendary drive along the California coast between San Francisco and Los Angeles takes in some of the most beautiful natural areas of the world. You'll pass the stunning area of Big Sur, Hearst Castle, millionaire hangout Malibu, and much else in between. I'd recommend taking a break in Big Sur and enjoying the Redwood tree forest, maybe staying in the Fernwood Resort for a night. Take your time, this drive is at least a full day's work, and bring your surfboard and camera as well. The best part is between Monterey and San Louis Obispo further down the coast. I'd recommend driving Highway 1 starting at the northern end, and ending up in Los Angeles. If your starting point is L.A. rather than San Francisco, drive up Highway 5 for a quick jaunt and stay in San Francisco or Carmel for a night before the big drive. To get here, you can fly into San Francisco, San Jose, or Los Angeles to pick up a car. Rent a Mustang or Dodge Challenger convertible for the best All-American road trip experience! More about visiting California at visitcalifornia.com. Drive to the southern-most tip of Africa via an ocean hugging road with amazing views and stops at South African vineyards, visiting beaches, and whale watching. The Cape of Good Hope, your destination, is also rumored to be the home of the Flying Dutchman ghost ship. Fly into Cape Town's International Airport and pick up a car rental. You may want to take in some of the other sights in Cape Town before leaving, such as the amazing Table Mountain or visiting the penguins at Boulder's Beach. The Cabot Trail in Nova Scotia, Canada, is a 180-mile scenic route around the rustic northern tip of the Cape Breton Highlands. This is an area where old Scottish influences are alive and well, with Gaelic spoken and ceilidh music flows as a soundtrack to your coastal drive. This drive is quite remote, and off-season very exposed to the elements, so remember to bring safety equipment with you. To get to the Cabot Trail, fly into the Sydney Airport, which is serviced daily by regular Air Nova flights via Halifax and on to New York, Boston, Montreal, Toronto and St. Johns. 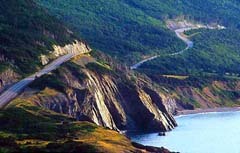 The full 411 on the Cabot Trail is at cabottrail.travel. If you don't recall Borat while driving down this bumpy and twisty road along the Albanian coast, you're missing something. This coastal stretch of Albania is largely undeveloped, with miles of pristine beaches to take a break at and enjoy the Mediterranean sun. It's Europe's last 'undiscovered' riviera, the nightlife is unsophisticated, the wine comes from local vineyards, and the mountainous scenery is amazing. Albania is still a very cheap destination, and you'll find that Albanians are not yet inundated with tourists and will show traditional hospitality towards any friendly visitor to the area. Fly into Albania's capital Tirana or the city of Corfu, and find a car rental there. Then drive down to Vlora (Vlorë) and south to Sarande. More information about this coastal drive and visiting Albania at albaniantourism.com. High mountain passes and ocean views has made the drive between Launceston and Hobart in Tasmania a favorite among petrol heads. Apart from the drive itself, the opportunities for distractions along the way; silver-colored beaches at Bicheno, and beautiful Wineglass Bay on the Freycinet Peninsula beckon. Getting to Tasmania is a little tricky, as it's both very far away from America or Europe and you have to transfer flights in Sydney, Australia. You can also take a ferry from Melbourne to Devonport, Tasmania, via Spirit of Tasmania. If you're willing to make the trek, there's much more to do and see in Tasmania, and you can find out more at discovertasmania.com. Quite busy in the summer months, the Amalfi Coast is a beautiful drive none-the-less. Starting at Positano and heading east, the next 50 kms (35 miles) are classic. You'll come across the clifftops of the car free village of Ravello and end up at the sandy beaches of Maiori. This area of Italy is much less rustic today than in the fictional movie "The Talented Mr. Ripley", it's still a traditional part of Italy with fishing villages, vineyards, and trattorias serving outstanding italian food. One of the easiest of our coastal drives to reach, the Amalfi Coast is serviced by the airports in Naples (also the regional capital) and Salerno. If you're flying in from the United States, it can often be cheaper to connect with a low-cost airline in London, or even drive down from Rome. 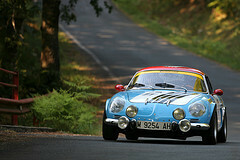 If your budget allows it, this is one drive where a classic Ferrari would be a great rental car! 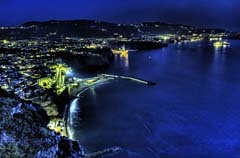 For more information about visiting Italy and the Amalfi Coast, visit italiantourism.com. Last updated by jack on 20 July, 2014 in Travel. Do not bother with South Africa drives. Way overrated. Stick to USA Big Sur or Route 1 down through the Florida Keys; absolutely beautiful scenery. South Africa is very disappointing and dangerous and overhyped. Their Apostles are nothing in comparison to those of Australia. Driven The Great Ocean Road Victoria Really great Drive. Also think West Coast of the South Island of New Zealand should Get A mention at least as good. 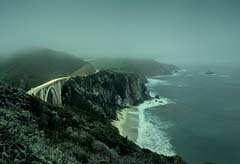 Going to california soon cant wait to go on Highway 1. Thank you Teral. I just updated the photo to one of Gordon's Bay, so on one of the main routes there. The photo for ''Cape Town to Cape of Good Hope'' is NOT of the right area! It is of a part of 'The Garden Route', another very beautiful coastal drive in South Africa but NOT as spectacular as the Cape Town coastal drives. There are two incredible coastal drives in the Cape area. One heads South from the city towards Cape Point, then back North via the phenomenal 'Chapman's Peak Drive' in which brightly colored orange cliffs plunge absolutely precipitously into a shockingly blue sea. This drive passes beaches of blazing white sand, one over 20 miles long, with turquoise waters in the shallows and sapphiric water in the depths. Magnificent. Millers Point, Kommetjie, Llandudno, Camps Bay and Clifton are just some of the beautiful towns on the route, all with jaw dropping views. The circuit is almost exactly 100 miles. Detour a little north too see the view from "Bloubergstrand'', which has been called the most beautiful view on earth. The other drive nearby is regarded by locals as possibly even more beautiful. 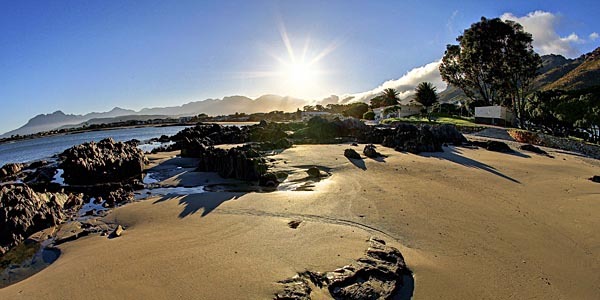 It is called 'Clarens Drive' or the R44, and connects Gordon's Bay with Betty's Bay for 30 Miles along utterly unspoilt coastline in which extraordinary mountains plunge deep into the water. Kogel Bay is especially noteworthy. It's untamed, stunning, magical. 50 miles further on the coast is the town of Hermanus, also beautiful though not *as* stunning! Inccredible for whale watching too. Anyway, those are the two incredible coastal drives I would nominate as my favourite ever. Others I've also seen would be Amalfi (possibly number 3, definitely top 5), The Garden Route, Central to Northern California, Parts of Sicily (golfo castelamare), Norway's Fjords, the Great Ocean road in Australia (etc). Clearly those two near Cape Toown though, google image searching will immediately show why! Even if you don't know how to take a picture you'll be able to there! However, I don't think it's quite so bad that you necessarily need to hire a driver. You should be fine on your own unless you drive at night. Having traveled the Road to Hana, I can tell you that it is indeed a beautiful drive. But driver beware! If you or your passenger(s) are prone to motion sickness, get out the dramamine. It's one majorly curvy road! Daryll, there's a ferry from Melbourne to Devonport, Tasmania via Spirit of Tasmania but nothing direct from New Zealand. It costs just over $200 Australian dollars per person and takes 10 hours, departure in the evening and arriving next morning. Your best choice is probably to fly directly to Tasmania if possible, otherwise take a flight to Melbourne and then ferry to Tasmania. Tasmania is really a place worth visiting. Its a beautiful tourist place. 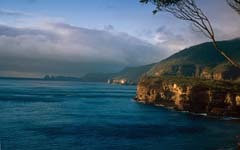 I am planning to visit Tasmania New Zealand. An article at octanmen.com says that sea route is the best way to land up in Tasmania. Just wanted to know is there any sea route from New Zealand to Tasmania.